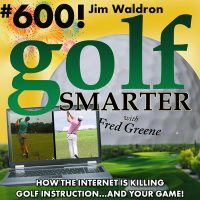 600: Jim Waldron of the Balance Point Golf Schools has witnessed a huge shift in golf performance and instruction since the overwhelming amount of information that has been offered by high speed internet. We call it instant gratification, Jim refers to it as Instant Contamination. There’s an intellectual exercise that should be incorporated into your practice and rounds, but because we have so much information to digest, it disappears in players who can’t understand why they’re not improving. As promised, if you appreciate Jim’s wisdom and perspective as much as me, and have not heard all that we’ve been blessed to share, here’s a list of each of the Golf Smarter episodes where he can be heard, including all the Premium Episodes that were never available to everyone till now!